Light and stylish, with an extended battery life so you can take it anywhere. Android 5.1 Lollipop to keep you in total control of your device. 5MP autofocus camera so you can accurately capture and share precious life moments. A digital playground and classroom to keep your child entertained and learning. 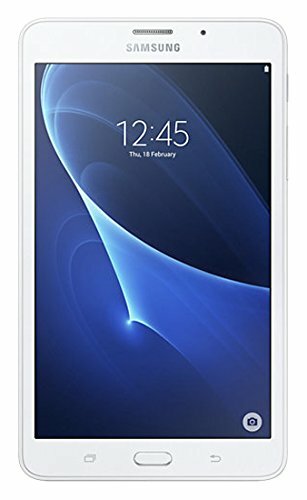 Stay on top of every aspect of your life with the featherweight and elegant Samsung Galaxy Tab A 2016 7" Wi-Fi + 4G - smooth to the touch, it is easy to use and practical to carry anywhere. Whether watching videos on a long commute or recording an event to share with friends, this tablet's battery keeps you powered without the need to recharge for up to eleven hours. With Android 5.1 Lollipop, you are in complete control of your Tablet Galaxy Tab A 2016, navigating intuitively from various tabs and programs, and with easy access to over 1 million apps available from Google Play. Take vibrant photos of your life experiences with the Galaxy Tab A 2016's autofocus camera - features such as panorama shots and sound captures let you cherish your memories for years to come. This Samsung Galaxy Tab A 2016 7" Wi-Fi + 4G Tablet is packed with fun and educational content to keep your kids curious for ages. Kids Mode lets you control settings so that you have peace of mind, and your child can freely and safely explore content that is both educational and entertaining.